The Camino Portugues is no ordinary walk. Sure, there is much that is “ordinary” about the mundane succession of villages, factories, shops, woodlands (sometimes tragically degraded woodlands), farms, churches, urban streets, barking dogs and suburban houses that pass by you as you walk. There is nothing natural and uniquely unsullied about the Camino. The tarnishing, despoiling hand of humankind lies over every inch. And yet… somehow the mystique of the Way transforms its ordinariness into something special. It is the essence of religion, and of religious experience, that the authority of symbols, language, history and art can make the ordinary seem extraordinary to those that have faith. 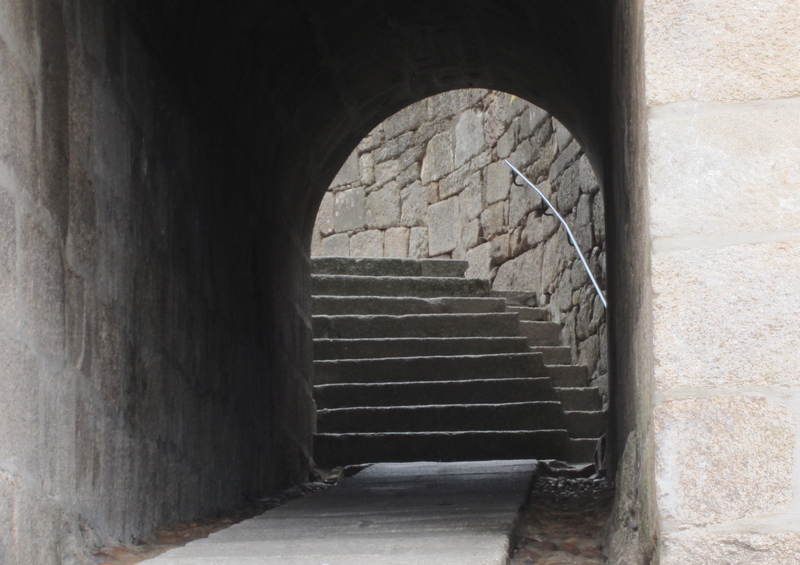 The Camino runs through the “Nuns Tunnel” in the old centre of Tuy. 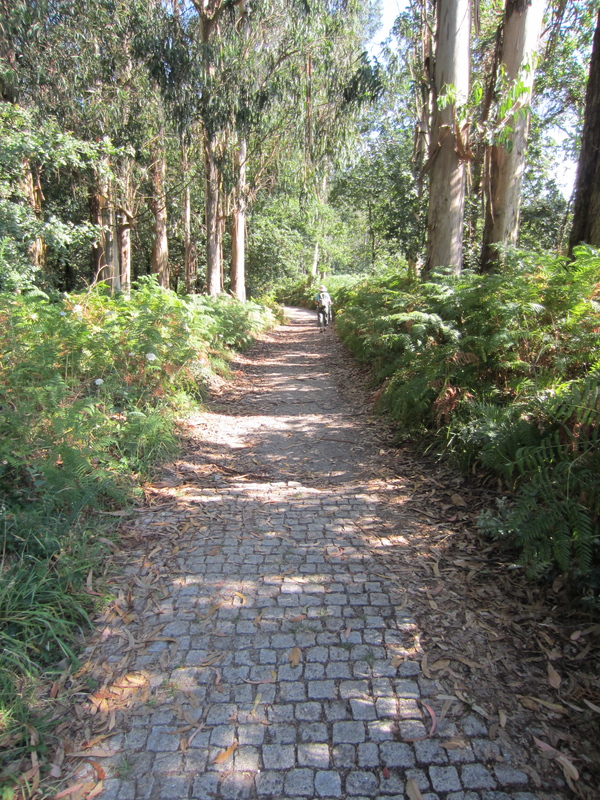 A segment of bush track in Galicia, with cobblestones and eucalyptus trees. 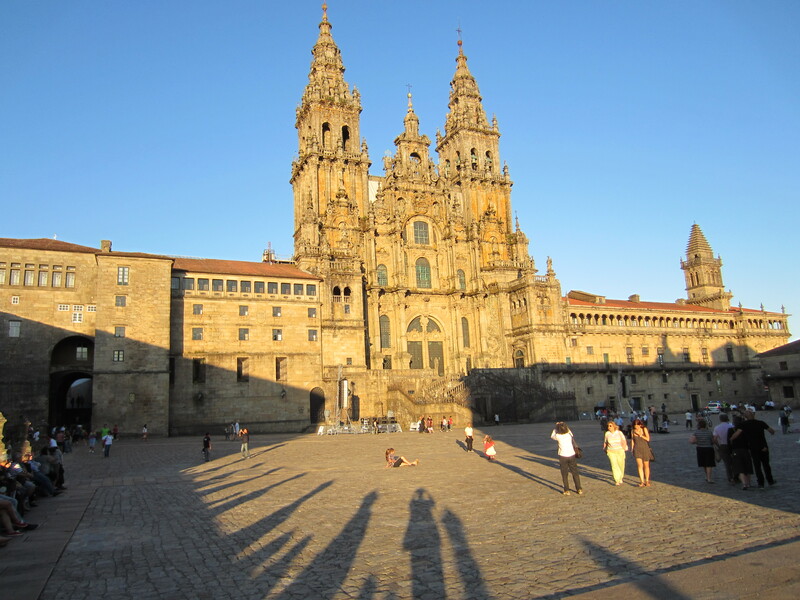 The Camino Portugues has immense variety, palpable history and, of course, moral-religious stature. It takes you through densely built urban streetscapes, rural flatlands, and rolling hills. One stretch, between Ponte de Lima and Rubiaes in northern Portugal, is “mountainous”, though the ascents and descents are only moderately hostile and the highest peak is just 470 metres above sea level. You walk asphalt streets and highways as well as cobbled lanes, cobbled village roads and cobbled urban footpaths. Sometimes, on narrow roads, you have to walk on rough verges and even in roadside gutters. The cobbled surfaces are especially challenging to walk on. They are (literally) rock hard, they are uneven, and they often extend for kilometres at a time. They delivered a hard pounding to my feet and my feet replied with blisters yelling their protest. You also walk on dirt and gravel paths and occasionally (but never for long) on tracks luxuriously carpeted with pine needles or eucalyptus leaf litter. In a few places the Camino shrinks to an unkempt track: the dry bed of a rock-strewn stream or a metre-wide trench amid jostling shrubs and blackberries that grab at you as you pass. Around you, the built landscape changes from dark grey medieval stone walls and bar-code city townhouses, to bland suburbs, to country lodges and farmsteads, to industrial estates: factories, warehouses, refineries, parking lots and vast yards full of manufactured litter. The farmland is very beautiful and very intensively cultivated, mostly in corn and grapes. There are no extensive grasslands. Nor is there any untouched wilderness left at any point along 230 km of the Camino Portugues. The path passes through many areas of cool woodland, but these are all secondary growth forests. In fact the most common forest trees along the Camino – especially in northern Portugal – are Australian eucalypts. We saw no signs of any wildlife, not even many birds. The silence of the landscape is a welcome balm for ears (and spirits) crushed by the din of highway traffic. But it is also an eerie warning. Behind the riveting beauty of the rural landscape in northern Portugal and on the approaches to Santiago in Spanish Galicia there is a environment hushed by its fatigue. The timeworn flagstones of Highway XIX north of Tuy. Everywhere the shadow of distant history haunts your steps. Through northern Portugal and across northwest Spain you walk large lengths of Highway 19. That’s not Highway 19 of Portugal or Spain, but Highway XIX of the Roman Empire. 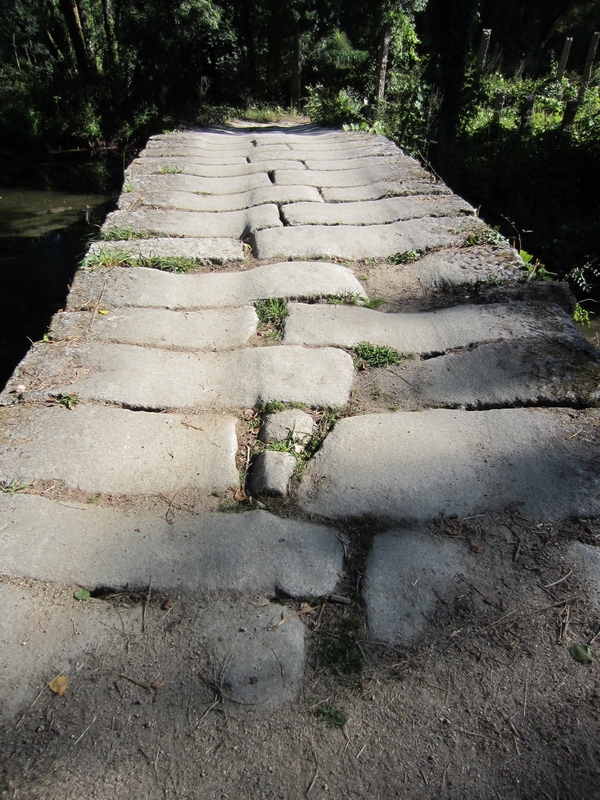 In places you cross bridges that the Romans built, and you walk over flagstones they (or rather, their plentiful local slaves) put in place around 2,000 years ago. There are many wayside stone crucifixes that bear witness to the antiquity of the pilgrim impulse. Some of them date from the middle ages when pilgrimage to Santiago was at its height. On them you see – in addition to the crucified Christ keeping watch over pilgrims – weather-beaten images of the pilgrims themselves dressed in long robes and carrying staves with water gourds attached to them. A wayside image of a pilgrim probably erected in the 15th or 16th century, with staff and (just visible at the top of the staff) a water gourd. You fill your water bottle at fuentes, or freshwater spouts, that refreshed pilgrims a thousand years before you stopped there. You pass through the largely unchanged ancient centres of town after town: Porto, Barcelos, Ponte de Lima, Valenca (you step off the Camino momentarily to explore Valenca’s beautifully preserved medieval walled town, the Fortuleza), Tuy, Pontevedra, Padron and Santiago itself. You stop at the doors of churches that have changed little in 500 years. You sit in the cool of tiny wayside chapels, breathing in the same calm that stilled the weariness of pilgrims 25 generations ago. Above all, perhaps, you feel your scepticism start to weaken as you digest the story of St. James (known as Santiago or Jacob). It is a story that every common-sense instinct tells you is pure man-made fantasy, and yet you start re-telling it to yourself, half accepting that holy stones, giant incense burners and scallop shells (on sale at 1.50 euros each) are proof of its truth. You hear that St James was an apostle of Joshua (better known as Jesus Christ, son of God) who was so ignited by the fire of faith that he took it to the ends of the earth – literally. At the time, northwest Spain was regarded as the westernmost extremity of the world, the last outpost of land before the endless western seas that extended to the edge of existence. After performing prodigies of missionary labour there, he returned to Palestine where he was arrested and executed by Rome’s local satrap, King Agrippa I. His disciples transported his remains back to Spain in a stone boat. Yes, a stone boat. And the stone mooring post where this boat berthed is still visible on the banks of the shallow river that runs through the town of Padron. Eventually his bones were interred in the place that now carries his name, Santiago, and atop his tomb a massive stone cathedral threw its spires high into the sky. Journey’s end. The many branches of the Camino converge on this square with Santiago (St.James) looking down from high between the twin spires of his Cathedral. This is what draws pilgrims. In the plaza before the cathedral they stare upwards with tears in their eyes, or they stretch out on the flagstones and sleep, or they hug each other and take photographs, or they fall into a frenzy of souvenir shopping, or they raise rah-rah sports chants, or they simply sit silent, silent, silent around the perimeters of the square. For every one of them the end of the journey has a message beyond simply arriving at a destination. The Camino seems to speak. Somehow its diverse beauties and its history give it a transformative authority. Even closed-minded cynics like me can feel it. My feet are aching not because I’ve hammered them on cobblestone anvils, my blisters are jabbing me not because of dermatological chafing, my rib-cage is sore not because I hurt it in a fall, my mouth is dry not because I haven’t adequately regulated my fluid intake to adjust to the ambient temperature. All these physical rebukes are moral rebukes. They are lessons that I deserve. If only I could read their messages I would solve my problems and be a better person. At a wayside snack-bar between Arcade and Caldas de Reis I exchanged a few words with a German walker, a young woman who had started her walk in Tuy. “What on earth have you got in there?” I asked pointing at her huge backpack. “Stones,” she answered with a slightly forced laugh. I thought she was joking so she felt compelled to explain. She staggered slightly as she heaved the backpack on to her shoulders. For a very fleeting moment something medieval, something deeply moral, something mysterious, something irrational but far more human than I am, passed across my line of sight. I guess it was the spirit of the Camino. Looking forward to the next instalment delivered from the Midlands! Thanks for your comments Lois. I’ve still got one or two Camino posts to make before I report on our Midlands/Cumbria experiences.